Education has the power to reduce extreme poverty and boost the attainment of development goals. Education means more than acquiring knowledge. It empowers people to develop and unlock their potential. Our idea with this Millennium Development Goal (MDG) installation “Knowledge is Power” was to raise awareness on the importance of education in the development process and to provide specific data about MDG 2 (“Achieve Universal Primary Education”). We also linked the topics of education, human rights, progress and development. The starting point was to establish a virtual classroom inside the Documentation Centre of the Loures Municipal Museum. The installation consists of a 1950s school desk with a modern school-based laptop for children on it. This laptop was conceived in Portugal and was sponsored by the government some years ago, as part of a technological plan targeted specifically at education (an initiative similar to the “One Laptop per Child” initiative). Any Portuguese visitor will immediately recognize both objects as being “related to the education system” and will have no problem in placing them within the correct era. A big poster is above the school desk, listing facts about the lack of education around the world. The laptop is connected to a Tumblr page that is packed with media (photos and video) on the issue of education, mainly using testimonies of African children trying to answer the question “What would you like to be when you grow up?”. Many children want to become professionals pursuing careers that require advanced academic skills and sophisticated education systems (doctors, lawyers and teachers). The children’s surroundings (schools lacking resources) makes the visitor think that education can help these children fulfil their dreams, but, if we do not act immediately, these children will soon become adults and a generation of dreams will die. The site also invites visitors/audiences to upload their video/photo showing their dream job. The laptop shows children trying to answer the question “What would you like to be when you grow up? Before starting anything, it is paramount to analyse carefully the pre-existing conditions at the site where the installation will be installed. The choice of site must satisfy both local criteria and Millennium Development Goal (MDG) criteria to enable the visitor to identify clearly both these aspects and to make the intended connections. With this premise, and taking into account the specific MDG to be implemented (MDG 2), the museum’s local Documentation Centre proved to be an easy choice. After choosing the exact location, it was necessary to reflect on the type of installation to deploy and to plan ahead. We needed to address the issue of education and to bridge the gap clearly between the local dimension of Loures and the wider dimension of so-called developing countries. We aimed to create a classroom that combined both regular and virtual learning. Therefore, we put together a 1950s school desk and a modern laptop from late 2010 and, in order to add more dimensions, we added a selection of local books and photos together with a world map displaying information about education in so-called developing countries. What message do we want to convey? How can we deliver it in a clear, visual way that gives visitors easy access to global education data and shows global inequalities? How can we present evidence of progress and setbacks over the past decade? With a wide range of areas to cover, the team reasoned that computer graphics would be the most effective tool for presenting the facts and figures that answer these questions. Designing an effective infographic requires specialized knowledge of statistics, communication and design. Therefore, having factored in our budget, we met with suppliers to present the idea to them. We wanted to highlight very clearly the power of education by revealing: the countries with the highest rate of students in primary education; the countries with the lowest rate; the ten countries with the greatest level of gender inequality in access to primary education; and the countries with the highest number of children out of school. During the meeting it became clear that computer graphics can illustrate global educational challenges, but they cannot give a voice to the real actors within these education systems. Therefore, we decided to collect images and videos of children, and decided that it would be appropriate to focus on children from Portuguese-speaking countries since the IMVF focuses its development work on those particular regions. Each child was asked to express his or her greatest desire and ambition for the future. In this way, visitors were confronted with testimonies from real people and not just numbers on a wall. 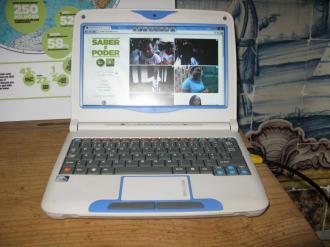 The best way to disseminate these images and videos of children would be to create a website that can be accessed on a small laptop/computer: the Magellan (presented as an innovative educational solution in Portugal). This website would be developed by suppliers and powered (and continuously uploaded) by the museum using a free platform. → Note: at the beginning of the implementation process for the ten installations, IMVF briefed the local suppliers on all ten installations and asked for three prior budgets from different museum companies (service providers). → Bear in mind: successful implementation depends on keeping to a tight schedule, allowing a concentration of tasks. While preparing the calendar, elements that had not previously been planned were considered and adjusted accordingly. Virtual School - On top of the 1950s school desk we have a laptop (the Magellan). On it, software is running that allows people to play videos of testimonies, revealing the importance of education for people from so-called developing countries and developed countries. They can also see and listen to a set of TED talks on the importance of education. The software also has a section where people can check facts, figures and infographics about MDG 2. Visitors can also find information about awareness-raising campaigns on the importance of education. In order to engage audiences/visitors/people, there is another section in the software where museum visitors are invited to share their messages on the importance of education. Photos and Videos - Using photos or videos acts as a reality check; it is important to have a real point of contact with the countries concerned. To facilitate the process of collecting testimonies, a small set of questions needs to be drawn up, as well as guidelines for the interviewer and the interviewee explaining the project’s overall objective and purpose, its duration and the aim for the set of pictures and videos. In our view, is it also quite important to allow those people interviewed to comment on the final product before giving their written permission for it to be released. → Note: Requesting permission and receiving clear authorization to use these images is a requirement that we must all follow. If you cannot obtain clear authorization, please provide information in such a way that the stakeholders can easily understand the implications of these pictures/videos and how they will be used in the future. Sheet/leaflet - The type of information we wanted to cover was identified, as follows: context; facts and figures; additional information; call for action; link between the local museum and the MDGs; and photos. Web domain - Figure out the name you want to give the digital platform. In case it is not a free platform, please remember you should register the website and pay for the domain, which is done on an annual basis. Infographic - We need to define how large the infographic will be and what kind of materials will be used, where it will be placed, and check whether it requires any kind of support. All necessary data and information for producing the infographic needs to be prepared and collected in advance. We recommend doing this during the first implementation phase. What should we say? After having identified the type of installation you want to develop and the place where you want to implement it, it is necessary to take time to reflect and to write down the message to be transmitted. Research - The collected data should be as accurate and up-to-date as possible. To achieve this goal more easily, please make sure your chosen topic relies on recognized sources with high levels of credibility and expertise, and that are based on high-quality research. If you are addressing a topic like the MDGs, it is almost compulsory to consult the United Nations (UN) website. We have consulted international organizations with recognized work in the fields of education and the promotion of universal primary education. Writing - Once the data and accompanying information is collected, it is necessary to compile statistical data for the computer graphics and more detailed information for the wording of the texts used in the support materials, including the website and the web platform. Briefing on images - To facilitate the requesting of images from colleagues located in so-called developing countries, it was crucial to brief them on the Museo Mundial Project. A range of important issues were identified. It was not always possible to collect these images since some of the projects on the ground do not work directly with schools and, therefore, contacting the educational community was less easy. However, it was possible to take pictures and videos from schools located in Angola, Guinea-Bissau and East Timor. → Note: if possible, photos should be printed and delivered to each participant. In our case, all Timorese children who participated in the project received their own photos. All information collected was afterwards sent to local suppliers allowing them plenty of time to develop their proposals and the corresponding support materials. The sheet/leaflet: The support materials are critical to ensuring that visitors reflect on the theme and analyse the information being conveyed. In this case, the message was clear, and supported by evidence and figures. We decided to use websites that called on visitors to take action. Mobilising citizens in support of social justice is a shared goal. Therefore, we also wanted to encourage individual responsibility. Two international websites and one national website were chosen to ensure that visitors were presented with the glocal dimension (global + local). The sheet/leaflet must have a strong visual connection to the topic under discussion. In this case, the sheet/leaflet was designed in shades of green to match the tone of the official icon of the MDGs. The leaflet is printed on A3 paper that is foldable into six sections to allow the reverse side to be used as a poster. For Museo Mundial, the leaflet included a picture of a child, the name of the installation, a QR CODE directing visitors to the project's official Facebook page and the project name. The leaflet also meets the requirement to give visibility to our financial supporters. → Note: The approval of the sheet can be a nerve-wracking and slow process. To optimise the time available, always ask a second person to proofread and review the final version. As for the photograph, make sure you ask for plenty of different proposals. Even if they are not used on the sheet/leaflet, they can later be used in the digital media. Once approved, the sheet/leaflet is sent to the print shop to print (2000 copies). Totem display stand: Once you decide to use a sheet/leaflet, it is crucial to identify a suitable stand for displaying them. 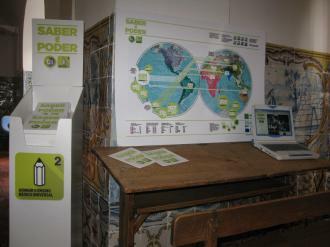 For the Museo Mundial Project, a totem display stand was chosen, with a top corresponding to the MDG 2 icon. The names and logos of the financial supporters are printed on the side of the totem display stand. Infographic: Setting-up an infographic means that you need to follow specific criteria. Researchers found that colour visuals increase the willingness to read by 80%. They are more accessible, increase comprehension rates and are more persuasive. They are easier to recall, fun to share and extremely engaging. In our case, the infographic material displays the following data: the ten nations with the lowest number of children in primary education; the ten nations with the highest growth in the number of children in primary education between 2000 and 2010; the ten nations with the highest level of gender inequality in primary school attendance; the ten nations with the highest number of children out of school. 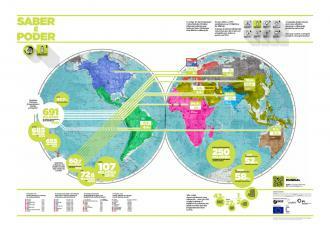 It also displays the number of children attending primary school across the world by continent. → Note: this problem will be solved. The Interpretation, Mediation & Education Service of the local museum will collect this information during guided tours. Visitors will be invited to record a phrase spontaneously, take a picture or upload a short video. Signs - sometimes it is crucial to put up signs for the installation, guiding and alerting the visitor to the right location. The sign was put up just outside the Chapel (please note the museum is located in an old convent). Once you have printed all the materials and have them ready to use, it is necessary to identify the best date for setting up the installation. Do not forget to record the installation process by taking photographs, and make sure everything is in order, with the space and the theme in perfect harmony. Initially, the infographic was fixed to the wall next to the school desk. Unfortunately, the glue used was not strong enough to hold it there for many days. So the solution was to attach the infographic directly to the top of the desk. The computer is also on top of the desk and is turned on to arouse the curiosity of visitors. → Note: a larger screen would make it easier and more inviting for visitors to read for longer. A reading list was put on the desk, which invites visitors to send their testimonies on the importance of education in their lives. The totem display stand and the respective sheets/leaflets are located close to the school desk. For the purposes of feedback, two bottles were put nearby. One bottle is empty and has the words "Place your vote" written on its label; the other contains pebbles that visitors can remove and place in the first bottle if they have appreciated the installation. As the project seeks to reach the highest possible number of visitors, a communication plan was drawn up for each of the ten installations. These identify key institutions to contact, communication channels and the type of message to convey. Facebook - Connected for a Better World. Given its widespread use in Portugal, Facebook is a powerful means of communication. The research previously conducted to complete the sheet/leaflet made it a lot easier to create in advance a “powerful post” to feed the project’s Facebook page. It is necessary to understand the impact that the installation has on the media agenda. However, it is still important to prepare and send press releases to the media, especially to the local press. To enhance the dissemination of the installation, a flashmail was produced that contains the image of the poster, a brief message on the specific topic, and a summary of the project and the organizations funding it. The installations must be publicised systematically and, if possible, by all stakeholders and partners involved through the use of their own (internal) communication platforms. Therefore, the installation was widely publicised through the project’s official Facebook page, the IMVF's website and the networks of our partners. It is not always possible to be present at the official opening of the installation. For this installation we chose to organize a virtual inauguration, which meant that the project’s Facebook page was put to use big time. A photo album presented the various elements that make up the installation. The inauguration took place on 25 March, during the month in which Women's Day is celebrated. To ensure the effectiveness of the installation, it was necessary to monitor it on a weekly basis. In this case, the museum staff must be asked for feedback and to pass on any suggestions that visitors might have mentioned. The contrast between the ancient education system (school desks from the last century, used during the Portuguese dictatorship) and modern education (with laptops designed for children) encourages discussion. In addition, a very appealing infographic was produced, which suggests the “world as a global village” where everything is connected (something that the laptops designed for children promote as an educational paradigm). Adaptation was the key word during the implementation of this installation. Initially conceived for use on a tablet (where the testimonies and photographs would run automatically), it was necessary to change it for security reasons. So, we opted for a small computer (a laptop designed for children, named Magellan), which meant that the small screen size made it more difficult to read the website. The lack of wireless internet access in the museum makes the installation lose some of its potential (the possibility for visitors to upload their own testimonies). The Tumblr website is accessible through a hardwired connection. Although the installation has been very well received by visitors among whom it promotes debate and reflection, visitors are unable to leave their own testimonies (about the influence that education has had on their lives). Maybe it would work better if visitors were invited to write down their thoughts. Those visitors who were interviewed gave positive feedback on the following: the way the theme was addressed through the use of computers; the way the computer graphics facilitated understanding the topic of access, challenges and inequalities in global education systems; the accessibility of the website and the way it invites participation; the installation fits well with the museum’s documentation centre.